Outstanding 4 bedroom, 4 bath oceanfront home with private *heated pool and stunning oceanfront views. This fabulous Forest Beach home will surely delight the choosiest vacationer! The first floor encompasses the living room, dining room, kitchen, 3 bedrooms, and 3 bathrooms. The first bedroom is the master king suite that overlooks the ocean and gorgeous pool area. The second guest bedroom has 2 twin beds and a private bath. The third bedroom with private bath has a queen bed and opens out to the expansive pool deck. The large chef’s kitchen decorated in dark cherry tones has a bar that expands to the dining and living area. Upstairs you will find a comfortable sectional sofa with a wall mounted flat screen TV, which is perfect for kid’s movie night! There is another master suite on this level with a king bed and large private bathroom. The private pool and spa deck has plenty of relaxing patio furniture and outside eating areas. The pool deck also hosts a porch swing to sit and enjoy the beautiful Sunsets. 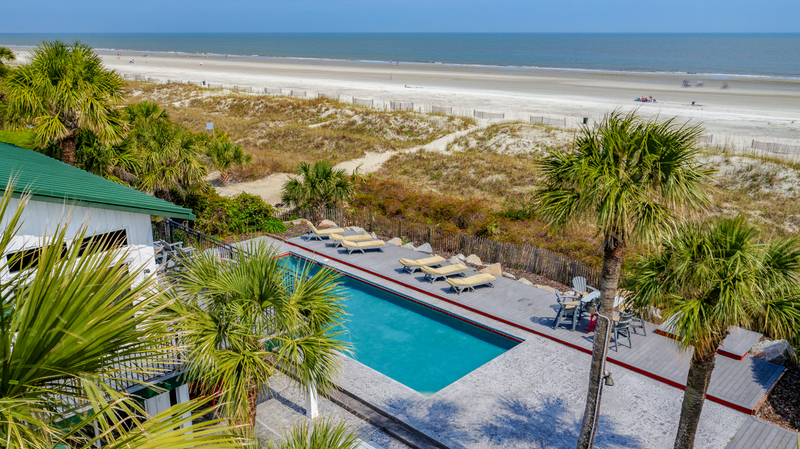 Reserve today and enjoy one of our premier oceanfront rentals on Hilton Head Island!